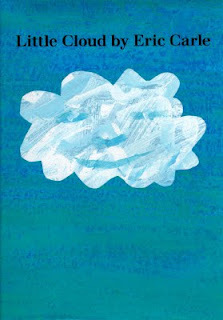 This week we have been reading Little Cloud , by Eric Carle. This is a story about a little rain cloud that changes into all different objects. Emily liked talking about the different pictures and things that the rain cloud turned into. I gave Emily cotton balls, white paint and blue paper and let her make her own cloud picture. ...and had fun stamping it onto the blue paper. She tested out wiping it across the paper too! When it got to filled with paint I gave her a clothes pin to hold it with...next time we will be doing that from the start! Emily's finished cotton ball cloud painting! If you did a book related project we would love to see it! Very cute! Have you read "It Looked Like Spilt Milk" by Charles Shaw? It is about different shaped clouds and what they look like. We read it often. It is a great book for kids. I'm sorry I haven't done a recent book project. I have one planned though so we will link up soon. I'm going to link an old book project - I hope that is okay. cool we will do our StArt today! We JUST found this book at the library and I had plans to do the exact same project that you have here!!!!!! That's a great book. We did a similar cloud project a few weeks ago. Raising A Happy Child told me about your blog. I am in the process of putting together a Unit on Clouds and am looking for suggestions. I loved the idea of the cotton ball and white paint. I will have to see if I can get the book as well.